In Search of the Miraculous: ten days of film, video and photography is a group exhibition of Irish and International artists set in the historic site of the former Beamish and Crawford Brewery in Cork. The exhibition presents works in the medium of film, video and photography and reflects the artists’ engagement with the idea of the miraculous exploring their search for the inexplicable in uncanny, humorous and often disturbing ways. The works vary from conceptual and romantic to poetical and highly personal. 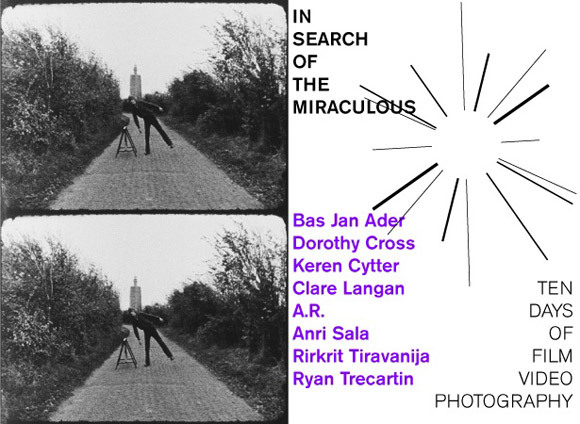 The exhibition’s title is taken from the iconic artist Bas Jan Ader’s unfinished multi-part project of the same title. Ader’s In Search of the Miraculous consisted of three parts; it began with a lonely night-time walk from the hills of Los Angeles down to the sea documented in photographs (One Night in Los Angeles, 1973) and led to the second part, an attempted west-east crossing of the Atlantic in a small 4-metre cruiser from which he never returned. The works presented in this exhibition all share, in different ways, Ader’s personal romantic quest for the sublime; as it is an exploration of the existential and emotional within our world. The notion of passing time in our lives is evident in the work of the Argentinian artist Rirkrit Tiravanija who made his debut this year at the 68th Venice Film Festival with the film Lung Neaw Visits His Neighbour. Receiving its Irish premiere, Tiravanija’s video installation Lung Neaw (2010) features the same elderly Thai farmer, Uncle Neaw, whose life Tiravanija has been documenting for the past 6 years, in turn raising questions about the passage of time and how people experience this in a remarkable way. Music as a miraculous source of inspiration and wonder can be seen in the work by the internationally acclaimed Albanian-born artist Anri Sala who presents the film Answer Me (2008). Winner of the Young Artist Prize at the 2001 Venice Biennale, Sala is known for exhibitions that question our relationship to the moving image and that highlight the influence of sound and language on the creation of physical and political space. Irish artist A.R. work, Untitled (2011), comes from a personal perspective that places the viewer on a voyeuristic journey. The journey is one of beauty and destruction, of inexplicable moments that we must experience before they are lost forever. The exhibition features Stalactite (2010) a video by the internationally renowned Irish artist, Dorothy Cross. The work shows the Great Stalactite of Doolin Cave, County Clare, which has grown over the course of a million years in its black chamber. A boy soprano stands beneath the stalactite, singing nonverbal sounds in a curious juxtaposition of the paces of human and geological time. Tel Aviv artist, Keren Cytter’s prolific artistic practice has gained an outstanding international recognition in the past few years. Video Art Manual (2011) which is being shown in Ireland for the first time, consists of a carefully staged construction of the artist’s own practice of choreographed parallel astonishing dramas and events. Irish artist Clare Langan’s experimental film State of Suspension (2011) displays a dancer who hovers between two worlds, the worlds of reality and the unconscious. The unreal and spectacular is a recurring theme in the work of Texas-born artist and filmmaker Ryan Trecartin who presents the video (Tommy Chat just E-mailed Me.) (2006). This video explores consciousness and a hyper-reality of the miraculous and humour of cyber love within the Internet. Structuring his art practice in the same way as a director approaches filmmaking, Trecartin’s unorthodox practice delivers uncanny reflections of youth culture, presenting a Generation Y zeitgeist of commodity anxiety, spiritual nihilism, and community value. In association with Gravity exhibition, 15th July–30th Oct.